Let’s combine three of my favorite things! Christmas. Discovery bottles. And easy. Throw them together and you get a jingle bells discovery bottle. This discovery bottle is part of my winter- and Christmas-themed discovery bottle blog hop, and there are three fantastic other discovery bottles at the bottom of this post. You may have seen jingle bells in discovery bottles before, so I wanted to add a little twist. We have these in liquid. Be sure not to put them in water though because they will rust. I just use a water bottle that has been emptied out. See my tip below to keep your bells nice and beautiful. In all honesty, this has four of my favorite things. This discovery bottle is magnetic! When I first began making magnetic discovery bottles, I figured out this incredible discovery bottle with magnetic chips, then made a way for them not to rust with my rust-resistant discovery bottles, and now we can make awesome new ones like this jingle bell discovery bottle. This one is actually three months old, and as you can see, it is still gorgeous! I have a really sweet story for you. This picture is worth a thousand words. It is a discovery bottle without a lid, and the thought of that makes me cringe! What I love about it though is that it represents so much more. As my son and I were doing this together, life happened. The baby started crying, and then my oldest daughter had four things go wrong all at once. I was being pulled in several different directions…and my husband stepped in to finish the jingle bells discovery bottle photos with our son. So while I have a lid-less discovery bottle posted and a bunch of oil spilled on the table, I was able to be mom to my daughters while the boys put this together for us. It’s the little things, right!?! 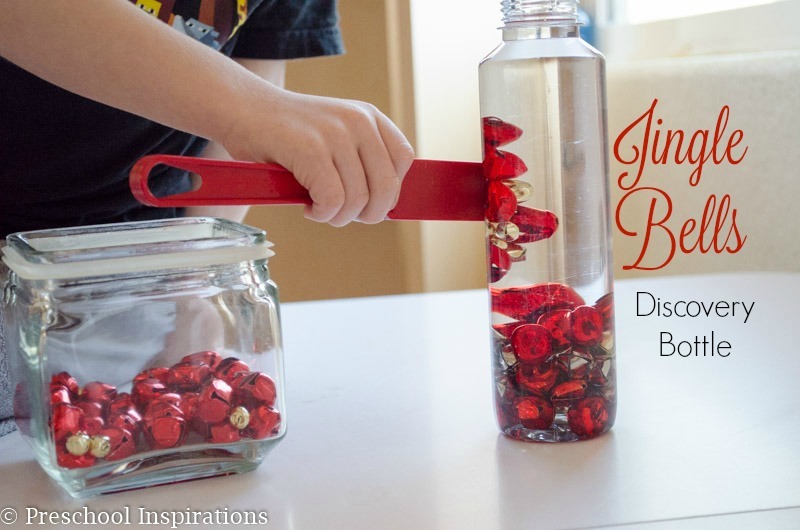 So here’s how you can make a jingle bells discovery bottle (with a lid, ha). First, empty out the water bottle! Any amount of water will produce rust! This needs to be 100% mineral oil. Voss water bottles are my favorite, but you can use any sleek water bottle, such as the ones with fizzy water. I find my Voss bottles at Kroger. I recommend using the 11 ounce bottles for little hands, such as young toddlers. You can read about my favorite bottles to use and where I buy them in my post How to Make a Perfect Sensory Bottle. 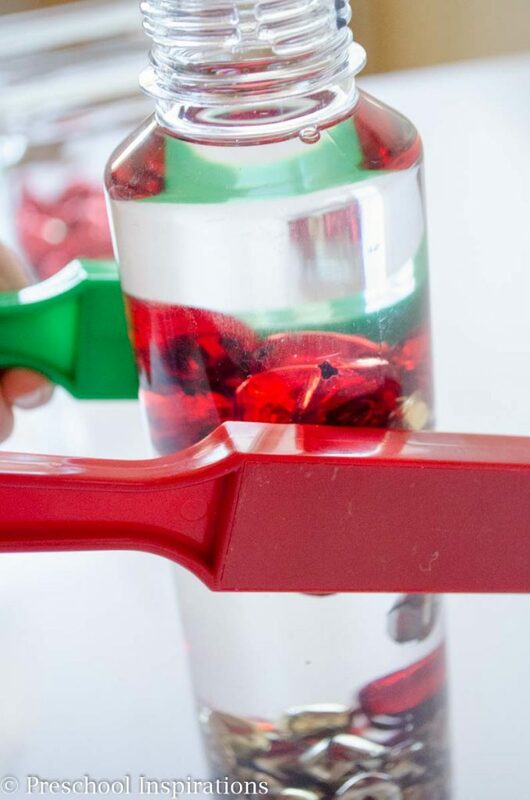 Add your craft jingle bells, then pour in some mineral oil. 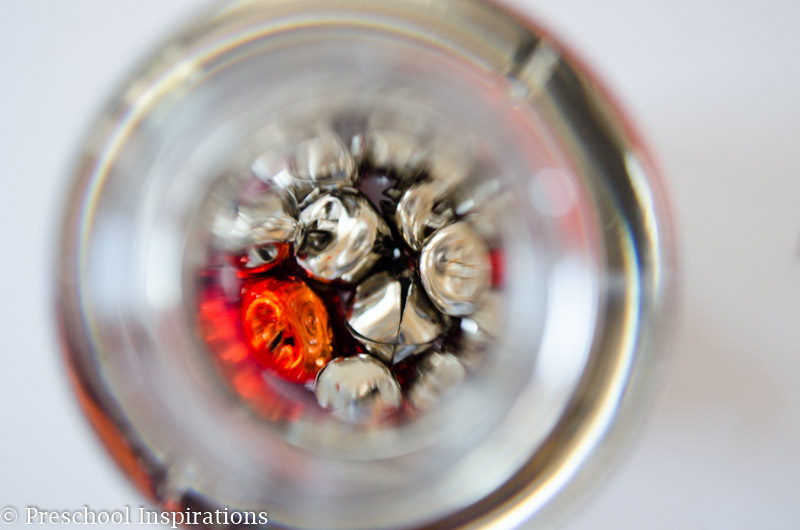 Mineral oil will keep your jingle bells nice and beautiful in the discovery bottle and prevent them from rusting! You can use baby oil too. 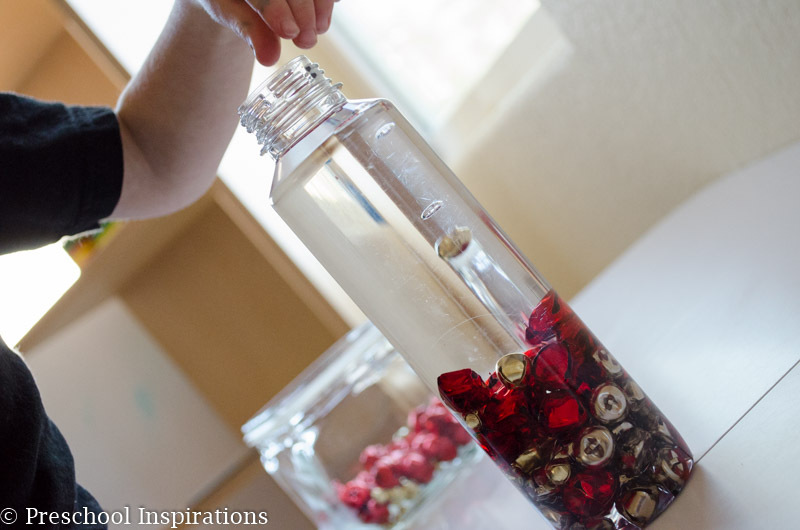 Now use the magnet wands to swirl the bells around and help them glide around the bottle. This would be a perfect science area activity or if you have a seasonal area, it would fit perfectly there. If you are like me, you have an entire shelf filled with discovery bottles. I am a self-proclaimed discovery bottle addict! This looks so fun! 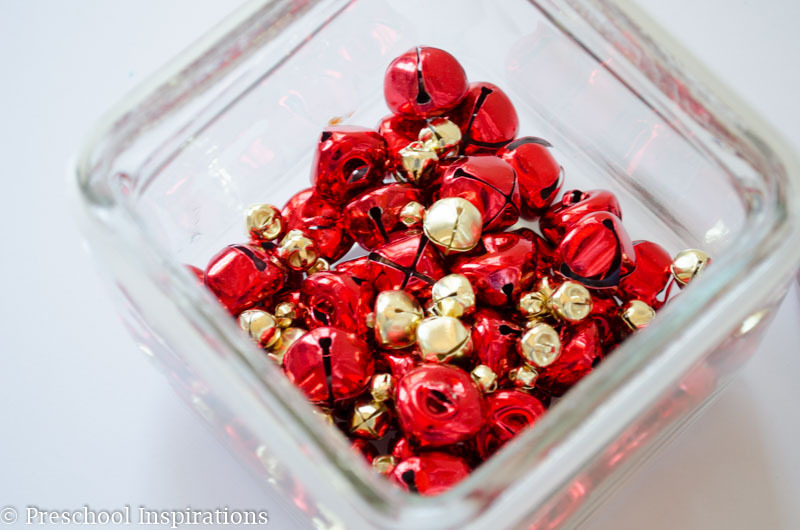 My boys love jingle bells – we’ll definitely try this! What a fun idea Katie! I love discovery bottles too and even more since I’ve gone back to teaching and realize that they can get a second life at school with my students – after my son has tired of one! And yes – definitely get the kids making them – so much fun. After adding the bells do you add mineral oil to the rest of the bottle? I love the sensory bottles. I love this and can’t wait to get to school tomorrow and get this made. Thanks so much for sharing. Yes, absolutely Sam! I hope you enjoy this! Thanks for visiting :).